Knitting Relaxes Me: Look! Knitting! But first, one last plumbing-related comment: Here is my new water heater, undergoing kitty inspection. 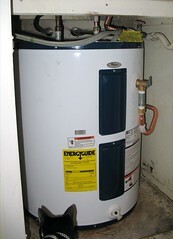 The water heater actually represents just a small portion of the plumbing work, and only about 15% of the money spent. However, it's the only thing I can take a picture of, unless you want to see the holes in the bathroom walls the plumber left. I'm lucky that my sister's father-in-law is very handy and works cheap -- he installed the water heater for me and will fix the holes. There has been some knitting going on. I'm still working on the second Wine and Roses Mitt for my sister. I'm hoping to finish it this weekend. 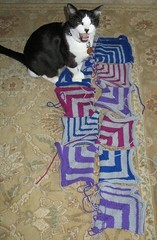 I'm also working on a Mitred Square Blanket, for the baby who originally was getting a hat. I originally had planned on 36 squares, but now I'm thinking 24 will be enough. I have 11 done now, and laid them out on the floor to get an idea of size. I guess you can say that Simon is included so you can get an idea of the size (although really he's included because he wouldn't move!). And although it looks like he's being fierce, in reality he was just talking to me. I also need to cast on for a Mason-Dixon baby kimono for the second February baby. On Wednesday, I have to take a quick trip to Harlingen (my institution has a branch there), and I think it will be good airplane knitting. 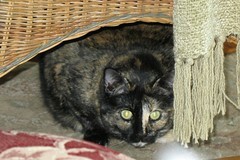 And, finally, because Simon is a ham who gets a lot more pictures on the blog, here's one of Harley, in one of her favorite places -- under a chair. ETA: If you've purchased Beaverslide yarn, you might want to make sure you keep it out of reach your dog, as Steve learned the hard way!